I am just studying the Leningrad now with Pruijssers & Williams excellent work. Will Marin cover 7…Qe8 or 7…c6? This is thé book I’ve been waiting for! This is just great News! This is a must buy! I also think it will be 7.-c6. Finaly the dynamic Leningrad Dutch gets the treatment it deserves. A solid addition. Absolutely will be buying. It will probably resurrect 7…Nc6. I’m hoping for Qe8 but guess it will be c6 (even Kindermann moved to c6 after being a long time advocate for Qe8). 7…Cc6 is the most “loco” out of the three, and 7…c6 the solidest. I highly doubt it would be 7…Cc6, especially for grandmaster repertoire. The “feed” only ever shows one single blog entry, just the latest one. Ditto for the comments feed, only the one single latest comment. Dear Quality Chess Team, I’m curious about the new Taimanov book… when do we get the chance to have a look into an excerpt? Wow, great news !! I just can’t wait ! Absolutely great, and a perfect companion to the Pirc! I.m.o. 7…Qe8 is quite playable, and since a recent book by Karolyi already recommended 7…c6, I’m hoping for the former. But either way it’s certainly a must buy! Give alpha zero some minutes and it will refute the dutch. During its learning phase, it never played the dutch consistently, so there must be something wrong with it. Luckily most of my opponents don’t play on the level of Alpha Zero. So it’s just three opening books? Stockfish actually won one of it’s games vs Alpha-Zero with… the Leningrad! At the moment I am learning the Leningrad, entering my variations in Mac Chess Explorer as a good boy and checking the eval’s with SF 10 (with contempt 0). SF 10 is quite optimistic (+ 0,6 FWIW) about white when it doesn’t look to deep, compared to the superficial eval’s it gives in Nimzo-Indian (around +0,2) lines. I don’t know what to make of it, but I thought it was interesting. 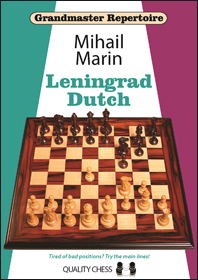 The Leningrad Dutch is not an opening to get equality but to overtake initiative quickly. Taking into the account logic of the game we assume White must make some mistakes to make it happen but isn’t chess the game of mistakes after all? If you are not 2600 or close to that level (and I am sure most readers are not but they care as if they were) I believe it’s a perfectly fine opening and you shouldn’t think about engine’s evaluation such as +0.5. I’ve been suffering in this opening playing against strong GMs (but maybe I’d suffer in other openings too) but it serves me as a great weapon to score points against other players. Playing for a win as Black is what every ambitious player needs when playing open events. Ah, so yet another opening not suitable for Correspondence. Sigh. I am very sure that I have seen 2600+ GMs, even the 2700s play the Leningrad Dutch in the couple past years. And at least more than one. @Alex Relyea In correspondence there is no point in playing tricky openings, uou just need to play for a draw with something solid unless you want to have some fun. Then maybe you can risk and learn something, it depends what you want but it’s not like the Leningrad is loosing. It just doesn’t have the same effect and I am saying this being a big fan of this opening. @Leon Trotsky It has been played few times but there is no strong GM who plays it very often. The strongest player who had it as a first opening choice was late GM Vladimir Malaniuk. I learnt from him a lot. Have you considered to include both 7…c6 and 7…Qe8? I would be even happier to see a discussion of 7…Nc6 8.d5 Ne5/Na5 as well. The last books I can remember including all this are the ones by Harding and by Hall & Cartier (both published 19xx). I hope he will clearly show the line(s) that are problematic to black. make’s the book usefull for both players.